You may love hiking, but you’ve never fully experienced adventure hiking until you’ve explored some slot canyons. 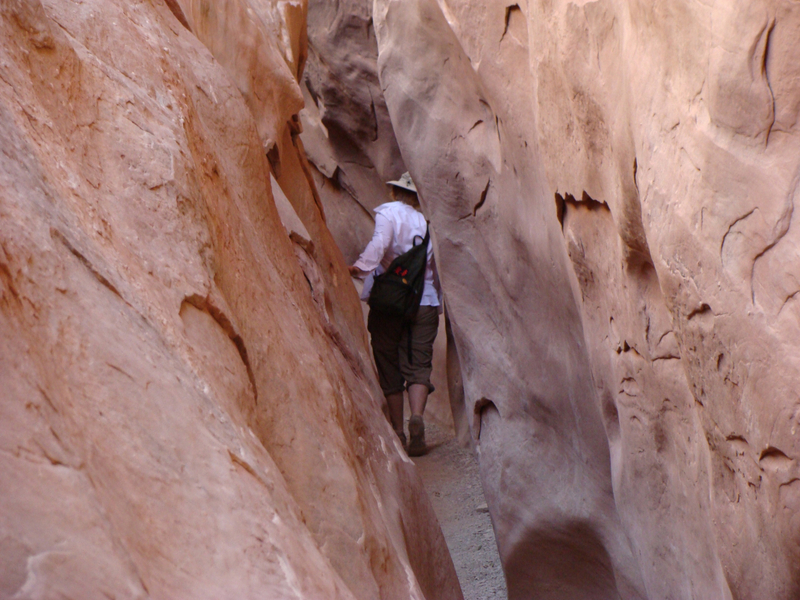 Slot canyon hiking is a mellower cousin of technical canyoneering, but it’s far more involved and exciting than your standard saunter through the desert. Indeed, slot canyoning is an exercise in human Slinky-ness: You shimmy, scramble, wade, scoot, slog, crawl, and problem-solve. You’re generally shaded from the blistering desert sun, and as most slots have water puddles (if not outright streams and pools), you can cool off along the way. This makes them an option even during primetime summer in Utah. Of course, slot canyons come with their own set of dangers, so it’s best to be prepared ahead of time and stay on your toes in the moment. Navigation isn’t always straightforward, so excellent route-finding skills and a topo map are a must. 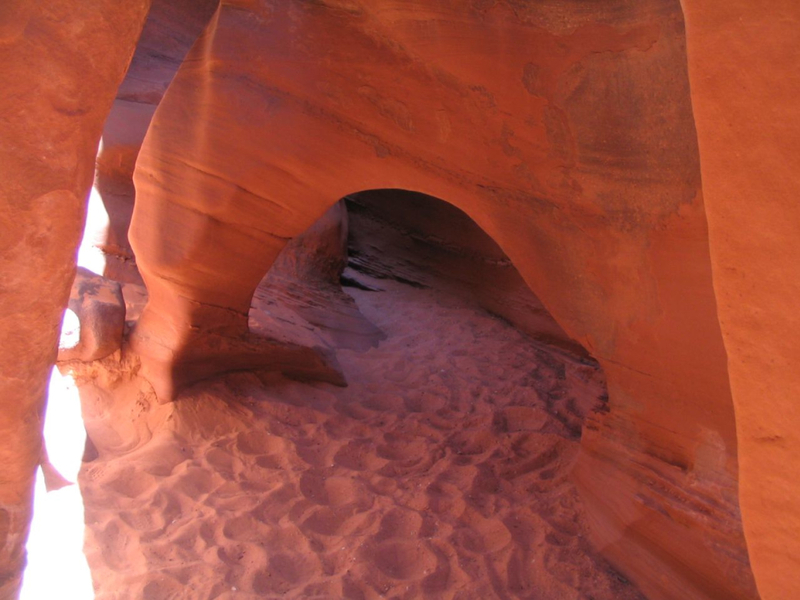 Also, keep in mind that slot canyons aren't usually dog-friendly if they involve very tight spaces and scrambling. You’ll also need to keep a sharp eye on the weather report: If there’s been any rain locally or uphill of the area, or if there’s any rain in the near forecast, be extremely careful of flash floods. They come with little warning, and if you’re miles into a slot with no escape, it can spell serious trouble. But if there’s no rain in sight and none on the way, you’re good to go. Consult with a local ranger if you want an authoritative opinion. Little Wild Horse at one of its less wild (and more open) moments. Many slots also require a cross-country schlep to get back to your starting point, and these walks are usually in full sun, with diminutive cairns that blend into the landscape. So you’ll want to be on full alert to stay on the right path, and keep plenty of water in your supply for this section of the journey. In addition, you'll need a handy map, good route-finding skills, a good attitude about scrambling and scootching, and a cooler full of beer back at the car. You will have earned it by the end of your excursion. Here, a primer on exploring southern Utah's best slot canyons—hikes you’ll remember for the rest of your life. You’ll want to budget the better part of a day to explore Little Wild Horse canyon’s eight miles of winding redrock slots and stunning open spaces. The trailhead is found in the Goblin Valley area, which has a lot to explore and ample camp spots. But Little Wild Horse is a treasure within an extraordinary landscape. The hike makes a loop that brings you back to the trailhead lot—and along the way you’ll wind, scramble, and shimmy through narrow rock slots, then open up in a flat riverbed, amble along a dirt path, and finally land back in rocky narrows as you complete the loop back to your car. 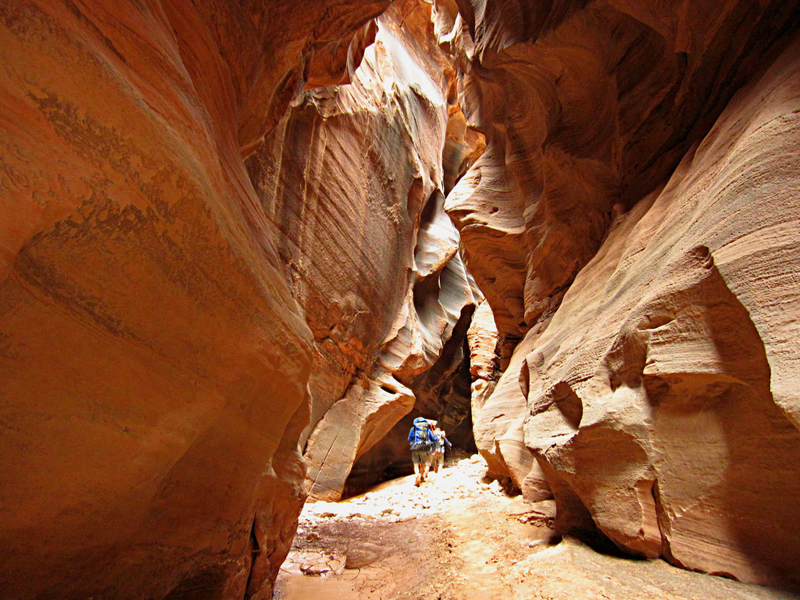 Buckskin Gulch is one of the longest and deepest slot canyons on the planet—and it’s found just a ways outside Kanab, Utah. Over the course of 13 miles, it rarely gets wider than 20 feet, and in many sections it’s just wide enough to walk through with your pack. The hike is long enough that many people make an overnight backpacking trip out of it, leaving a shuttle car at one end. If you’re coming in with overnight gear, you may want to put key items like your sleeping bag and change of clothing in a dry bag. Another option: Go as far as you can for the day, then turn back to where you started. One high-stakes factor is that because the canyon is so long, it takes a while to get out of if a rainstorm comes through, which means you’re exposed to serious flash-flood danger in a contained area. Be smart about only hiking it when there are no storms in sight—and no storms upstream, either. You need to snag a permit for this hike, and remember to wear water-friendly shoes in case you end up slogging a bit deep in the canyon. A detailed guidebook and topographical map are recommended as well. 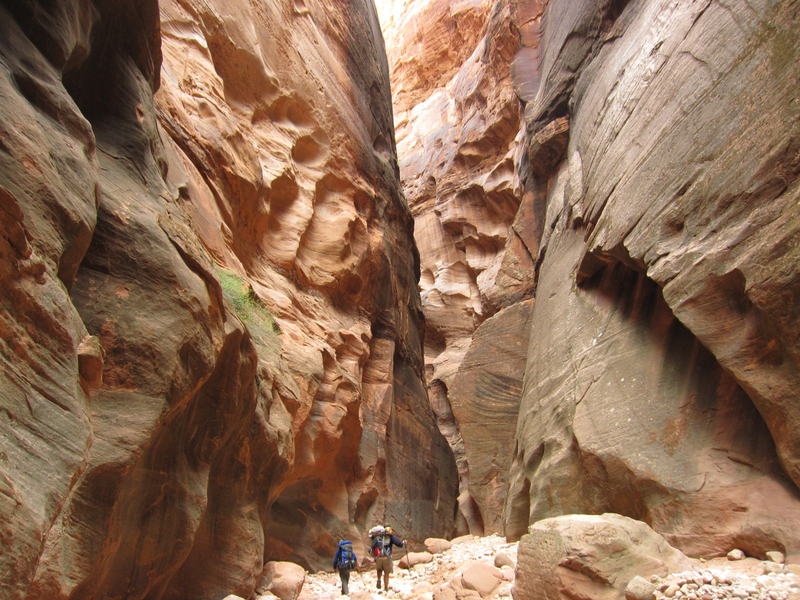 Hiking the Narrows takes some logistics and thoughtful packing, to be sure, but it’s beyond worthwhile. 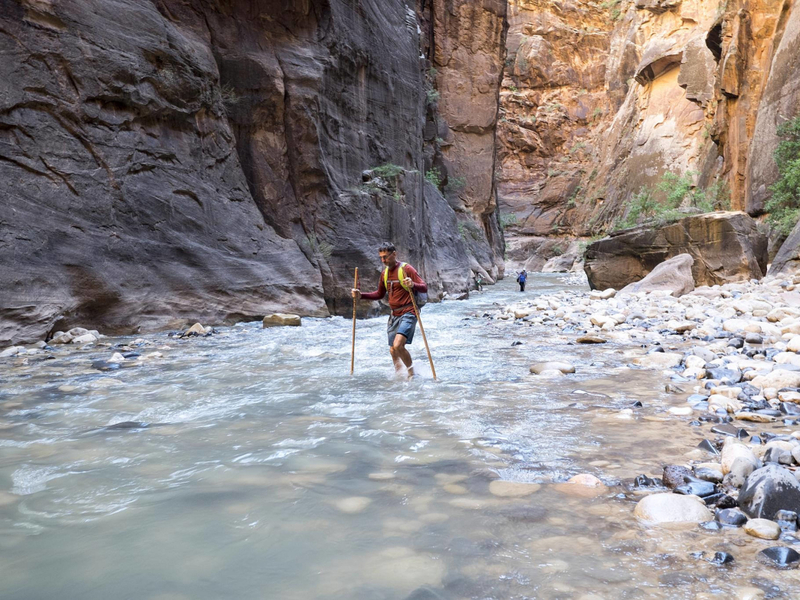 You’ll travel 16 miles through one of the most glorious gorges in the world, your feet kept cool in the Virgin River, as you gaze upward at the 2,000 feet of soaring redrock cliffs on either side of you. Zion National Park bustles in the summer, brimming with tourists (so many, in fact, that the park recently closed the main road to private vehicles and requires visitors to take shuttle buses instead). So it makes sense that the most accessible part of the Narrows, the bottom, is heavily tracked. But hiking the narrows from the top, 16 miles upstream, removes you from the masses and lets you take in the canyon’s full splendor in peace. You’ll need to plan for a permit, pack light, wear water-friendly shoes, bring a water purifier, and keep your group size reasonable (12 people or less, but honestly a much smaller group is more enjoyable). You’ll also need to arrange a car shuttle to get back to your starting point at Chamberlain’s Ranch, a 1.5-hour drive away. 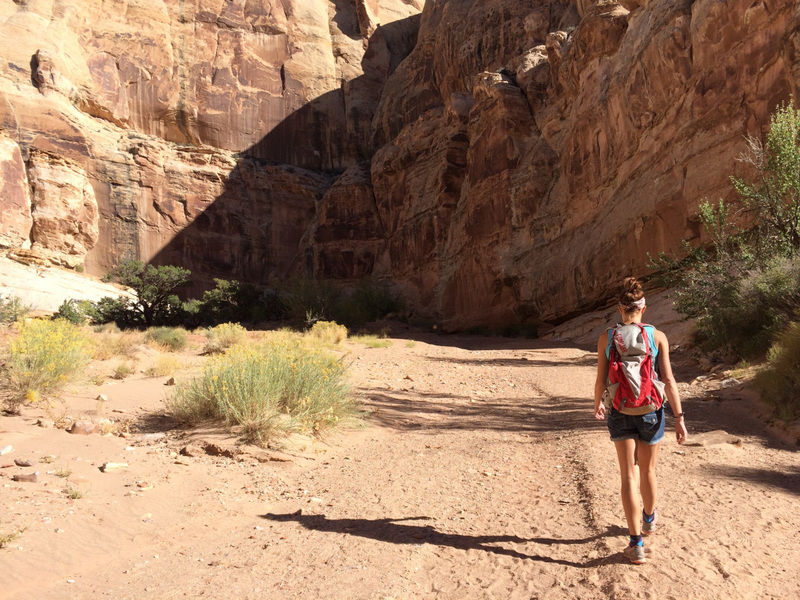 Each day you’ll have to hike the full day, usually wading through water, which feels delightfully refreshing when you’re backpacking in the desert. At your mid-way point you can find an established camp site (there are several to choose from) and settle in for a night under the starry sky. Technically, Peek-a-Boo and Spooky are two different canyons, but they’re often paired together in one loop hike since they run alongside one another. Everything about these canyons is an adventure, starting with their location in the Escalante area, a surreal landscape of twisting slots and crannies carved into the ancient desert. And the drive to the trailhead takes you 26 miles down the Hole-In-The-Rock dirt road, a historic wagon trail. You’ll then meander down the rugged Dry Fork road to an overlook parking lot. And then the hike begins. From the belly of Dry Fork Canyon, you’ll access Peek-a-Boo gulch by scrambling up a set of stair steps carved into the rock. You’ll ascend up this slot canyon till you top out on the plateau above, then walk a short distance southward till you get to the next sandy wash that drops into Spooky Canyon. You can descend through Spooky to get back to Dry Fork Canyon where you started.